Potato side dishes often accompany our food. If you want something piquant for a change, put this on your table. You’ll wonder why you never tried it before! If you want something tastier than your usual boiled potatoes, try this one and taste the zesty difference. Perk up your fish and meat dishes with this quick and simple recipe. In a medium saucepan over medium heat, boil some water. When it boils, add salt and drop in the potatoes. Simmer for 15-20 minutes or until they are tender. While waiting for the potatoes to cook, prepare the dressing. 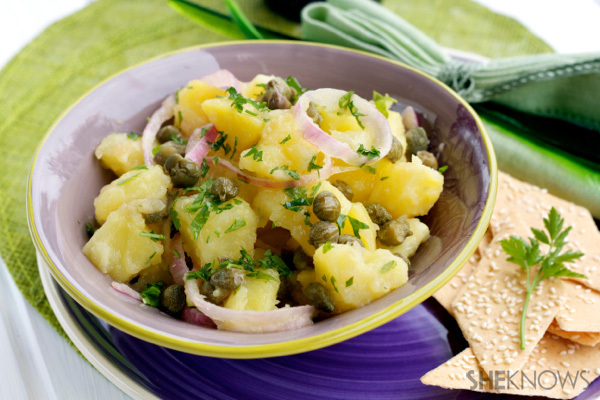 In a small bowl, whisk the extra-virgin olive oil, vinegar, the juice of 1 lemon, parsley, salt and capers. When the potatoes are tender, drain them and transfer them to a bowl. Add the onions. Pour the dressing and mix. Add more extra-virgin olive oil if desired.